Arcade-style sports games really only needs a couple things - accessible and fun gameplay and decent presentation. Unfortunately, Bush Hockey League, formerly Old Time Hockey, only gets half of it right. The 70’s era presentation with N64-esque visuals is absolutely amazing and makes the game incredibly appealing, but the gameplay is just the total opposite of fun. The gameplay is slow and clunky and feels terrible and it just ain’t very good. 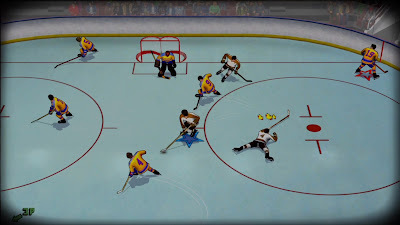 I don’t care how hard you may be nostalgia-ing for an oldschool hockey video game, Bush Hockey League will not satisfy you. See all of the details in our full Xbox One review. Bush Hockey League is an oldschool throwback to not just classic hockey video games but 70’s hockey culture and even movies like “Slap Shot”. The presentation is just 70’s perfection right down to the mullets and creepy mustaches, perfect hockey arena soundtrack selection, and the fact almost no one wears a helmet. 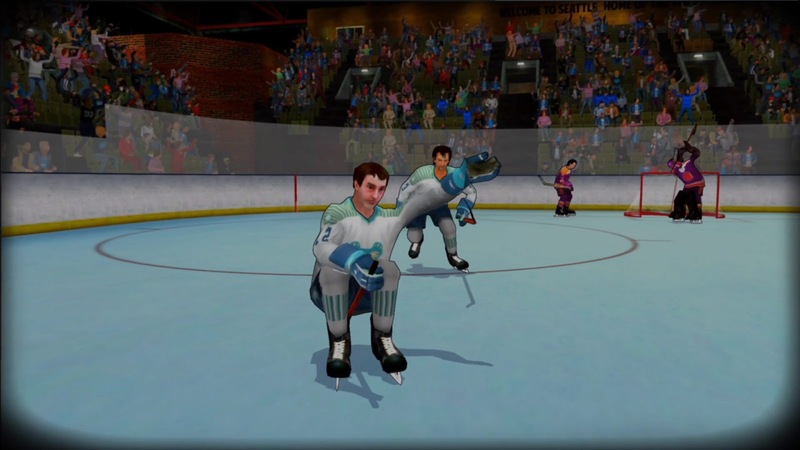 The game takes place in a fictional Northeast minor league hockey division where the players are moderately skilled, but clearly not pro material. The era the game takes place in also is the era of goons and enforcers in hockey, so expect a lot of hard hitting, relaxed rules, and bench clearing brawls. It’s easy to fall in love with the game right away just soaking in the presentation. The story mode, too, is very promising at first. You take over the reigns of a last place team in the midst of a lost season and try to brawl your way up the rankings. Your team is terrible, though, so rather than winning the story mode gives you specific objectives during each game in order to make progress. You have to do things like hit a specific player, score in the last period, or lose by less than 10. The story mode is full of comedic moments and goofy stuff and, like I said, the movie “Slap Shot” was a clear reference. There’s more to the story mode but I don’t want to spend too much time on it because there is a far more important aspect that Bush Hockey League fails miserably at – the gameplay isn’t very good. Who cares how interesting the story mode may be (and what flaws it may ultimately have) if you don’t actually want to play it! 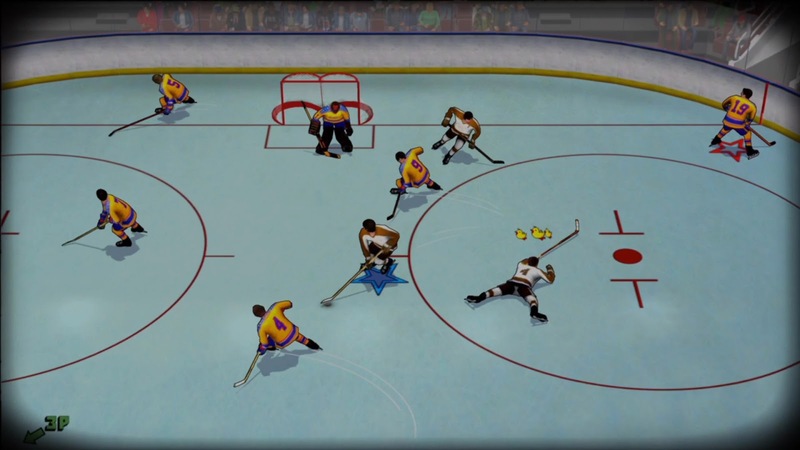 The premise behind Bush Hockey League – to recapture the oldschool hockey video game feel of simpler controls and simpler times – is extremely appealing to me. My favorite hockey games are honestly probably NES Ice Hockey and Wayne Gretzky’s 3D Hockey, so Bush Hockey League should be right up my alley. But it just plays so badly. You expect arcade sports games to be fast and easy to pick up, but Bush Hockey League is weirdly slow and clunky. Players don’t immediately respond to button presses, so setting up precise passes and one-timers just plain doesn’t work right a lot of the time. Movement feels bad and the fact you lose control of the puck when you use a speed boost makes it feel even slower and clunkier. Maintaining control of the puck is a crap shoot in general as an opponent coughing in your direction from 10-feet away causes you to give up the puck. The fighting, which is supposed to be a major draw in the game, is also terrible and unresponsive and not fun. It’s such a frustrating slow terrible playing game overall. Even with multiple control types including a modern setup with right analog stick controls like EA Sports NHL, a two button retro style (which I prefer), and even a beer mode so you can play the whole game with just one hand, Bush Hockey League never really hits that sweet spot of accessibility and intuitiveness that oldschool arcade hockey demands. I will say two good things about Bush Hockey League, however. One, hitting opponents out on the ice actually does feel pretty satisfying. The hits are really quite hard and brutal and nailing a guy in the open ice or slamming someone against the boards feels good. The fights that occur afterwards, not so much, but the hits during the course of play are great. 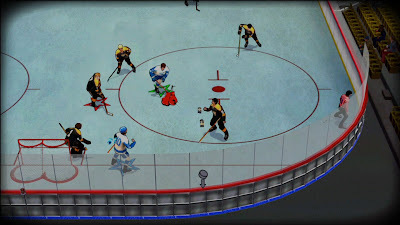 The other good thing that I will say is that Bush Hockey League can be an OK local couch multiplayer game. When both players have to deal with the same cruddy controls and gameplay you can kind of just turn your brain off and have fun with it. Playing the A.I. is a chore, though, as regardless of the difficulty level you select it’s brutal. I’ve already praised the presentation, but I just can’t get over how much I love how the game looks. From a current-gen perspective it is objectively pretty ugly, but it’s supposed to be a throwback to a simpler time and it absolutely nails it. The N64-quality player models and animations are perfect. The menus are spot on. The music is outstandingly perfect. I also have to give props for having lots of different camera angles to choose from. It’s just too bad the most important part – the gameplay – is so poor. This is a game that I want to love and sing its praises to anyone that will listen due to the presentation, but I just can’t because it’s no fun to play. Bush Hockey League is one of the most disappointing games of 2017. Skip it.